I haven't come across them after his disgrace and disinheritance, so it seems it 'died' with him. This also concerns Obu Toramasa. Yamagata Masakage inherited the Obu contingent after Toramasa's suicide. I haven't come across the red Obu banners after that and may have disappeared, replaced by Yamagata banners. The red-armoured men in the front-ranks of Yamagata Masakage's contingent made a lasting impression on Tokugawa Ieyasu. I assume many were former Obu men in red armour, but now wearing black Yamagata sashimono. This is how I see the 'red regiment' under Masakage. Also I was thinking last night and I think we confused each other when we were talking about the colored bands representing companies or contingents. Nobukado's 1st contingent 1st company would have 1 white band. Nobukado's 1st contingent 2nd company would have 2 white bands. Nobukado's 1st contingent 3rd company would have 3 white bands. Nobukado's 2nd contingent 1st company would have 1 yellow band. Nobukado's 2nd contingent 2nd company would have 2 yellow bands. Nobukado's 2nd contingent 3rd company would have 3 yellow bands. with each of his contingents having different colored bands. In that matter nothing would repeat itself because the blue background and white mon would not change so it could still be identified as his and not Anayama'a contingents Or his and katsuyori's contingent if using the white/black mon flags. Maybe that is a better explanation then the one I was attempting before. Right now, I personally would apply this rule for ALL samurai armies. The Hojo's colored regiments and the Uesugi are examples. The most often used color for 'company bands' is WHITE on dark color flags (black/blue/red) and BLACK on light color flags (white/yellow, also on red/blue). I've corrected Yoshinobu's sashimono. Still looking at Naito. The NUMBER of bands, NOT the color of the band, would be 'universally' recognized. Instead of colored BANDS to identify a 'second contingent' for the SAME commander, often an entirely DIFFERENT BANNER was used. Example: Naito, Katsuyori, Nobukado, Yamamoto, Sanada. All with at least two versions. The Sanada three or four while serving the Takeda. The most often used color for 'company bands' is WHITE on dark color flags (black/blue/red) and BLACK on light color flags (white/yellow, also on red). I was just clearing up what I was trying to say is all. I plan on doing Nobukado's two Contingents in my army as one blue and one white as per your example. Did you ever find the missing Naito brother's name? No luck. I'm thinking 'Kudo' as the brother's name instead of Naito. Does anyone have the Nobori for Mori Nagayoshi (killed at Nagakute) on their computer? Rin Byo To Sha Kai Jin Rettsu Za Zen! The nobori will be an easy one. It's just plain white. This is a 'work in progress'. The set comes from the Nagakute screen. There are other sashimono not shown here yet, including a larger 3d fan samurai sashimono. Excellent (and fast!) work as always Evalerio! 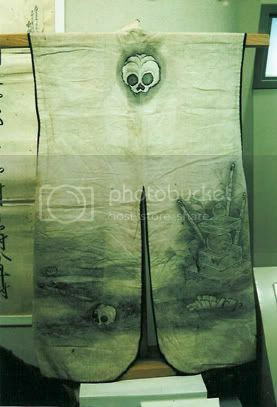 Date Masamune's personal standard of a white flag with red disc. Dark blue nobori with gold disc. O uma-jirushi of two black umbrellas topped by a gold plume. 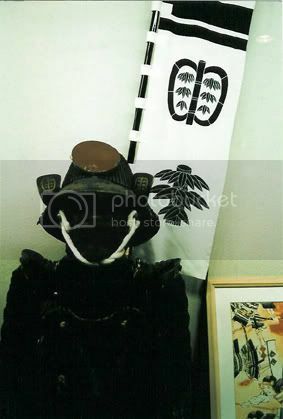 Ko Uma-jirushi of black banner with black plume. Not seen: White sashimono with black lovebirds mon. NOTE: very similar to the white Uesugi sashimono on the Samurai Heraldry Gallery. Here's a website that I had to share with everyone. I apologize if I'm off topic. 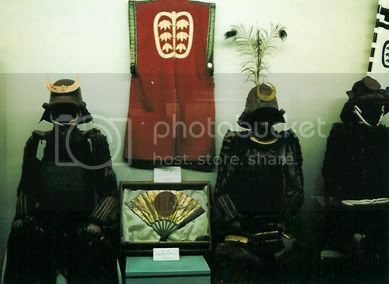 It has alot of samurai heraldry items that are interesting. The banners are very nicely done. But it isn't clear when one set of banners begin and end, so some 'sections' might cause confusion as they combine banners from two to three different clans. The Kyogoku with the Hosokawa. The Ogasawara with the Nakagawa (center section). The Asano with the Tsugaru (right section). Asano with an Ikeda I have not yet identified (center section). The Niwa, the Shimazu and Aoki combined (left section). It will be fun sorting them out. Very nice! I want the "Superb Pair Of 18th Century Russet Iron'Tsu-tsu Gote'". New license plate design for moped in Ueda city has Sanada's Rokumonsen on it. How OBATA Masamori sashimono look like ? In Nagashino Osprey, samurai mounted wearing white sashimono with Obata's Red Mon. NOTE: The plant mon painted on the breastplate and the fan painted on the back, two motif used on Obata sashimono. I haven't come across an explanation for the alternate design for Obata heraldry. Modern day reenactors use the simpler red mon on white for both Uma-jirushi and sashimono. Color plates in different Turnbull books use the same simpler red mon on white for Uma-jirushi and sashimono. Ashigaru sashimono tend to be of simpler designs than those of samurai. It is possible that the simpler red mon on white would be used by ashigaru and the more elaborate bamboo fan and plant mon on white used by samurai. Banners for Uesugi Kenshin and three of his generals appear on page 2 of 'Samurai Heraldry Gallery'. Hi, I just found pics of the O Uma Jirushi. The names of the daimyo are listed but unfortunately I can't read japanese. Here's the first scroll. Here's the sixth and final scroll. Here is the link to where I found them. The website is pretty difficult to navigate though. It's all the way at the bottom. I now know what I'll be doing for the next twenty years!! NOTE: In MANY examples the 'groupings' of flags do not represent a set. "Groupings' could represent half a set from TWO different daimyo. The left half with the rest of that set disappearing to the left of the photo. The right half with the rest of that set disappearing to the right of the photo. In other words, you have to look at two successive pages to see a complete set. Not all, but enough to be confusing at first glance. Any chance you might do a plate for the Shimazu?